Happy Sunday to you; I hope you had a nice Saturday :) The weather has been quite ok so far. Next week, the temperature will go up again in Holland. Up to 17-18 degrees Celsius they say! Feels a bit like spring in the middle of autumn. Speaking of seasons: seasonal products are the best! There's pumpkin, pear, green beans, endive (Penny, the guinea, is very happy :)).. 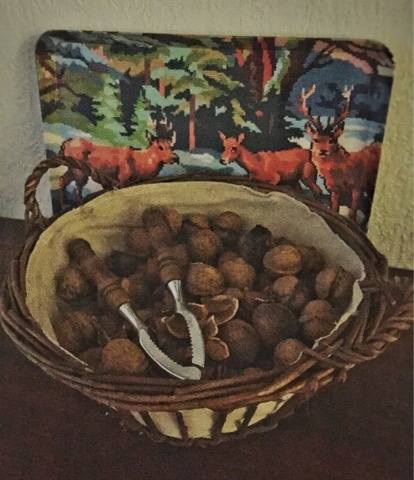 But also: nuts. My mom came home with a bunch of fresh walnuts last week. Walnuts are lovely; though it takes some strength before you can eat them ;) I visited a nice cooking store in The Hague and found a recipe for cake. 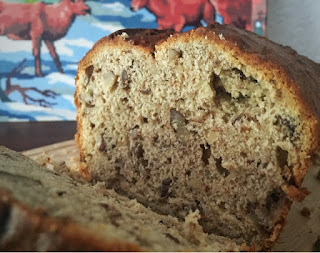 This weekend's bake is based on a recipe by this store and contains a lot of nuts and banana. Looks good, doesn't it? It tastes very good with some Earl Grey tea :) The best thing about this cake is that it works on your five senses. You can actually see, smell, taste, feel and hear (when you take a bite) the nuts and bananas. It's so amazing, I just have to share this with you. Start by pre-heating the oven to 180 degrees (celsius) fan. Butter the cake tin and place a sheet of baking parchment in the tin. 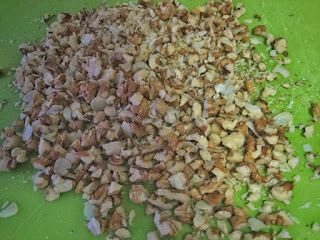 I love the smell of chopped walnuts and almonds.. Even more when they're roasted! 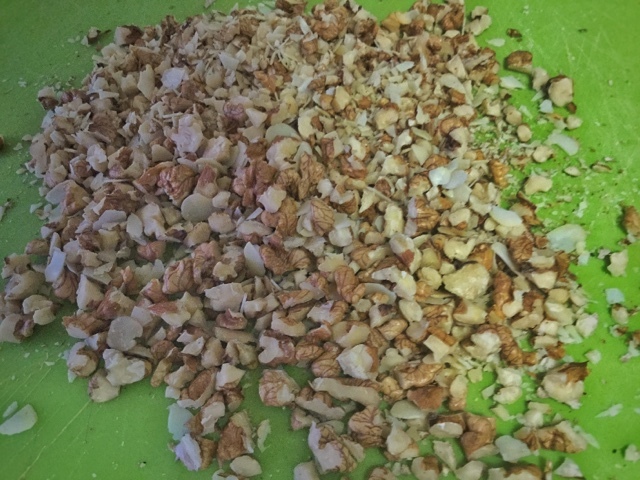 Mash the bananas and chop up the walnuts and almonds. Leave them a bit chunky, it's nice to have a crunch when you take a bite! Cream the butter, brown and vanilla sugar. This takes about 5 to 10 minutes. Add the almond extract and the eggs, one by one, and mix well. Add the mashed bananas and chopped nuts and self-rising flour and mix well. 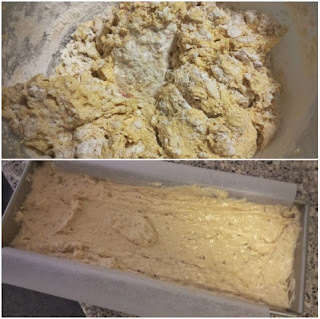 Pour the cake mixture in the cake tin and leave it in the oven for approx. an hour. The cake is ready when it's golden brown and a bamboo skewer comes out clean. Leave it to cool in the tin for 5-10 minutes, then place it on the cake rack to cool completely. Lovely filled cake.. Can you see the chunks of nuts? - Unless you're terribly afraid of getting salmonella, I can really recommend to always try the batter. It's the best way to taste if the flavour is strong enough. - This recipe is great to bake if you want to get rid of left-over bananas in your fridge. 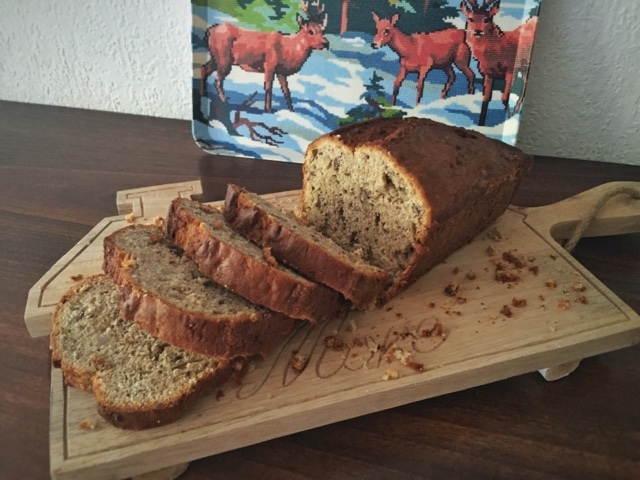 Old or brown bananas are perfect for baking or mashing! 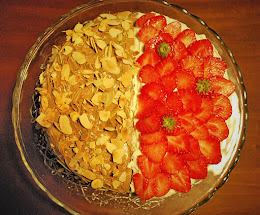 Definitely try it sometime, it's very good cake :D and very easy to make too!